M is one of the lovely ladies at work who started her knitting journey with me just over a year ago. In August, I believe, I sent a loom home with her. Shortly thereafter, she purchased one of her own. She bought a 16" Ashford-like rigid heddle loom from Handywoman on Etsy. (As of this morning, she did not have any of these looms available in her shop, but she is a very nice lady. Just send her a message, if you interested and tell her I sent you!). M has been going great guns on her loom, and she even managed to get her visiting mother-in-law and sister-in-law to weave on it! As the sister-in-law boarded her plane back to Australia, she was sending M photos of floor looms she wanted to buy!! Several weeks ago, M said she would like to make tea towels, but I told her she needed one that would accommodate a 20-inch weaving width. Two days ago, M mentioned again, she would like to make towels. 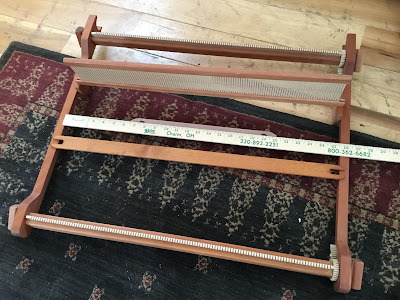 This time; however, I reported I had seen a used 24-inch rigid heddle loom available here for $65. I emailed her the link and, a few minutes later, asked if she had received it. "I have already sent her an email." 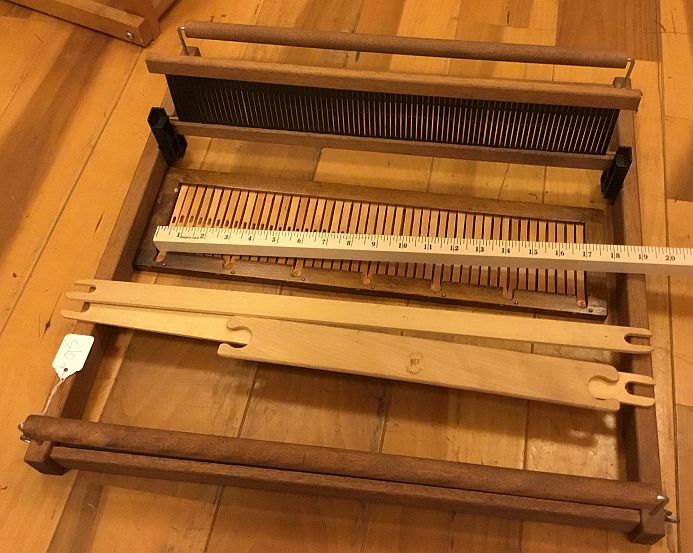 The woman responded and told her that she had posted the picture of a 20-inch loom, instead of the 24-inch, but both were available at the same price and it would only be a little more to ship them both. M did what any reasonable human would do under the circumstances, she bought them both!! Yesterday afternoon I was chatting with my friend L, who bought my LeClerc 36-inch four-harness floor loom in April. So delighted with M's success, I shared the transaction. L responded knowingly: "OMG. It's a disease." I had to laugh because she was right! Although, it is much less like the plague and far more like gold fever or yarn fever. As to the knitting, the younger daughter came into my room to visit with me last night, as I worked away on her sweater. After she shared the events of her day, I held up my progress and warned her "I'm trying to get this done on time." I thought she said: "As long as it's done by Christmas." I blinked twice, and she looked at me funny. "That's the goal." I told her. She shook her head and slowly repeated herself: "It doesn't have to be done by Christmas." Must have been the yarn fumes and the excitement of loom acquisitions because that is not what I thought I heard. So, after today, I will be off work until after Christmas. The Macomber is scheduled to have two new harnesses added to it this weekend (I love my husband), and the warping thread I need is not due to arrive until Tuesday. All that means is I have a decent chance of knocking out the sweater this weekend and on Monday. Anyone else feeling the crunch?